Over the month of May, Ali MC, a producer from Melbourne, is working with NG Media and providing assistance to our musicians and bands with the recording and distribution of new material. 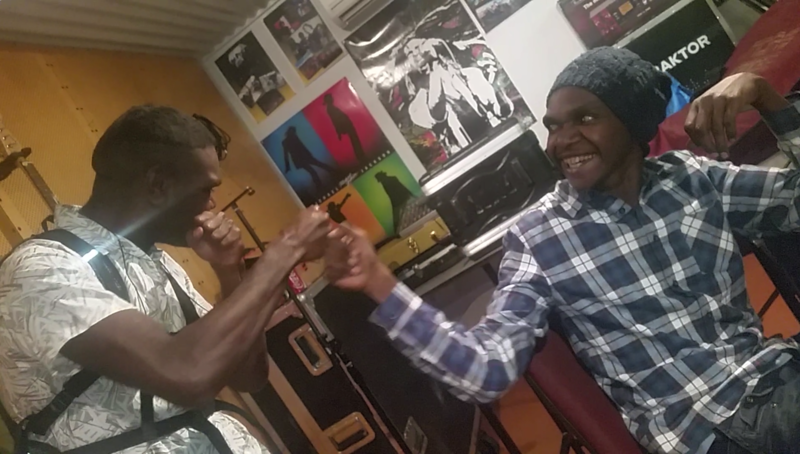 Already he has visited the bands in Blackstone and Warakurna, and worked closely with local NG Media producer, Matthew Lewis, to mentor, pass on new skills, and produce some new recordings. He was there to see and record the reaction of Matthew and Salty Lewis listening yesterday to a live stream of Sydney radio station, Koori Radio 93.7, playing their new song. Well done guys! Ali is also assiting NG Media to put some plans in place to develop the music program into the future. Some exciting news will be announced in the coming days.